This was an emergency booking after the original booking got cancelled due to a fire so I wasn't sure what to expect but it proved to be a great little stay. The nature of the trip meant we were stopping in quite a few non-touristy areas and this was no exception. The hotel looked to cater for passing traffic rather than tourists. Clearly they get the occasional Brit as there was a Yorkshire flag above the bar. The hotel bar was a gathering place for the locals which created a great atmosphere. The room was clean and comfy and ideal for an overnight stop. The village was very traditional and didn't really cater for tourists but there was a really nice local bar with a shady garden - very relaxing. Precio a la calidad de la habitación no esta mal para pasar una noche, el cuarto de baño esta bastante bien. De paso a Portugal ideal para pasar noche. Totalmente recomendable. Relación calidad/precio. Habitaciones cómodas, funcionales. Íbamos en familia y nos dieron distintos tipos de habitaciones, todas dobles, aunque unas mejores que otras, pero todas correctas. Esperaron la llegada hasta muy tarde sin problemas. Todo muy limpio. Muy amable la chica recepcionista del turno de noche. Un lugar agradable en un pueblito zamorano. Tranquilidad en el pueblo. El personal muy amable, habitacion limpia y con lo necesario. Um hotel económico, mas muito limpo e com pessoal simpático Mesmo junto à Estrada 122 e de muito fácil acesso. Queríamos um Hotel para descansar uma noite e sair cedo, para continuar a viagem e foi o que encontrámos. O jantar também estava muito bom e não foi nada caro. Las camareras muy buena gente y personas honestas. Camas cómodas. Ducha con mucha presión. Amabilidad del personal. Comida del restaurante de bastante calidad y abundante. This original guest house offers free Wi-Fi in all areas. Centro Turismo Rural Lajafriz is set near the N-122 main road in Fornillos de Aliste, between Alcañices and Zamora. All rooms at the Centro Turismo Rural Lajafriz have panoramic views and satellite TV. 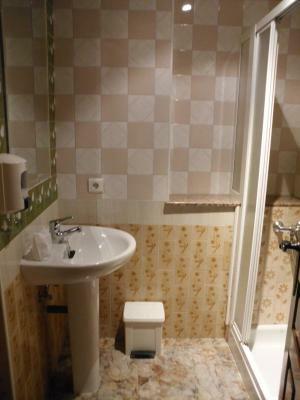 Bathrooms are en suite and well-equipped. The design of the building includes local stone and wood. 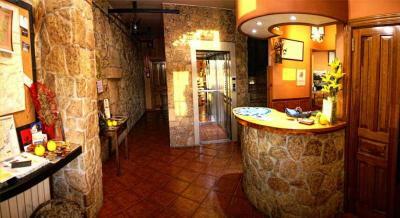 There is a children’s playground, a bar-café and a lovely dining room with a fireplace. Just north of the Centro Turismo Rural Lajafriz are the Sierra de la Culebra Mountains. Here there is a famous hunting reserve. It is a short drive to Portugal and Montesinho Natural Park and there is free public parking on site. The local area is also ideal for fishing and hiking. This property also has one of the top-rated locations in Fornillos de Aliste! Guests are happier about it compared to other properties in the area. This property is also rated for the best value in Fornillos de Aliste! Guests are getting more for their money when compared to other properties in this city. When would you like to stay at Centro Turismo Rural Lajafriz? This triple room offers 3 single beds or 1 single bed and 1 double bed. 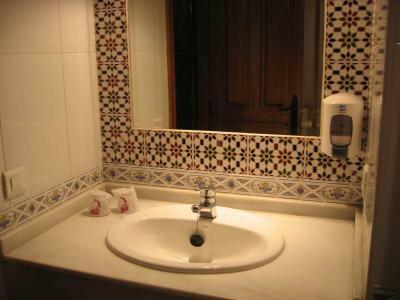 House Rules Centro Turismo Rural Lajafriz takes special requests – add in the next step! Centro Turismo Rural Lajafriz accepts these cards and reserves the right to temporarily hold an amount prior to arrival. Not a dislike more words of advice. This is a very traditional Spanish village that won't see a lot of English tourists so if your language skills aren't great and you don't like communicating in the international language of mime you might want to give this one a miss.